Four Seasons Pizza – We pride ourselves on offering you delicious combination of the most fresh ingredients and flavors. We pride ourselves on offering you delicious combination of the most fresh ingredients and flavors. 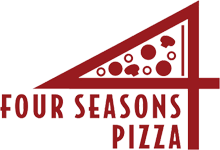 At Four Seasons pizza we pride ourselves on making your experience a great one. We offer dine-in, carry out, and delivery. Everything is made fresh to order just for you. Fresh, never frozen pizza dough is made daily at each of our stores. We are family-friendly and take pride in serving our local community. Fresh, fast, and delicious…come see us soon!